Do You Need a Power Flush? What Type of Heating System? When Should a New Boiler Be Installed. What is a Saniflo Macerator? A Solution To Low Water Pressure. Are You Entitled to a Free Gas Safety Check? Gas Leaks - What To Do. For your added security. The Saniflo SaniAlarm will alert you if the water level in your macerator rises to a high level. This model is suitable for most new or existing Saniflo installations, and is quickly fitted onto the lid of a Saniflo unit. Sometimes accidental use, power failures, limescale build up of deposits in very old units (not regularly descaled), can cause a surgee of water into the unit. The alarm then emits a continuous 80 dB warning sound, until it is switched off and the problem is corrected. 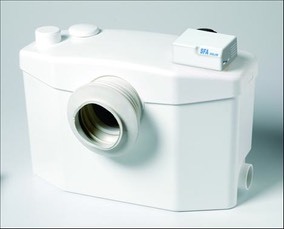 SaniAlarm is battery operated and is suitable for most models in Saniflo’s range, including Sanispeed and Sanivite pumps. A Sanialarm is ideal if your Saniflo is boxed in or hidden behind a wall or cupboard. If you saniflo were to malfunction you would be alerted immediately and this will prevent further problems should they arise. All you need to install a Saniflo alarm is some good practical skills and a 10mm drill bit, the rest is easy. Suitable for new or existing Saniflo installations. SaniAlarm is quickly fitted onto the lid of the Saniflo unit. *Not suitable for use with Sanicom, Sanicondens, Sanicompact and Sanicubic. Insert the Batteries (not supplied) in the case. Carefully drill a 10mm hole in the lid of the unit where indicated in the instructions. Fit the SaniAlarm on top of the Plunger tube. Switch to the ON position.